This page on Femtocell tutorial covers femtocell network architecture. It describes LTE, WiMAX, 3G(UMTS) femtocell architecture types. Various interfaces between system elements are usually mentioned in the network architecture document. The figure depicts 3G femtocell architecture in UTRAN network as per UMTS specifications. As shown the HNS(Home NodeB subsystem) is composed of HNB(Home NodeB) and HNB-GW(Home NodeB Gateway). The HNS is interfaced with MSC using lu-CS interface for circuit switched services. 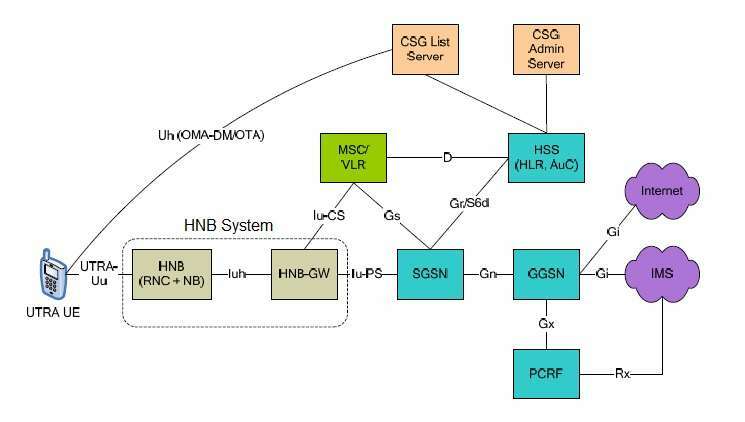 The HNS is interfaced with SGSN using lu-PS interface for packet switched services. lu-h interface is the interface between HNB and HNB-GW. HNB has functionalities of both RNC and NB. Refer UMTS network architecture for more information. LTE is defined in 3GPP specifications. It supports OFDMA modulation in the downlink and SC-FDMA modulation in the uplink. It supports FDD and TDD topologies. Based on this, TD-LTE femtocell and FD-LTE femtocell exists. Refer LTE tutorial for LTE system basics and architecture interfaces. 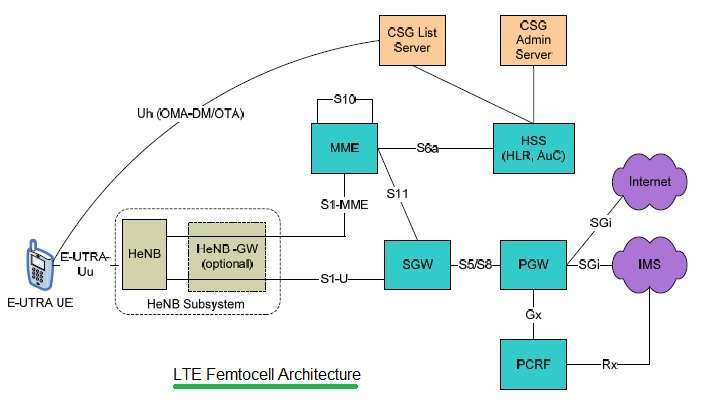 The figure-2 depicts LTE femtocell architecture in E-UTRAN network as per LTE 3GPP specifications. The HeNS(Home eNodeB Subsystem) composed of a HeNB( Home eNodeB ). HeNB-GW is included optionally in the network architecture. As LTE is all packet network. HeNS is interfaced with EPC using S1 interface types. It is interfaced with SGW using S1-U interface and with MME using S1-MME interface. 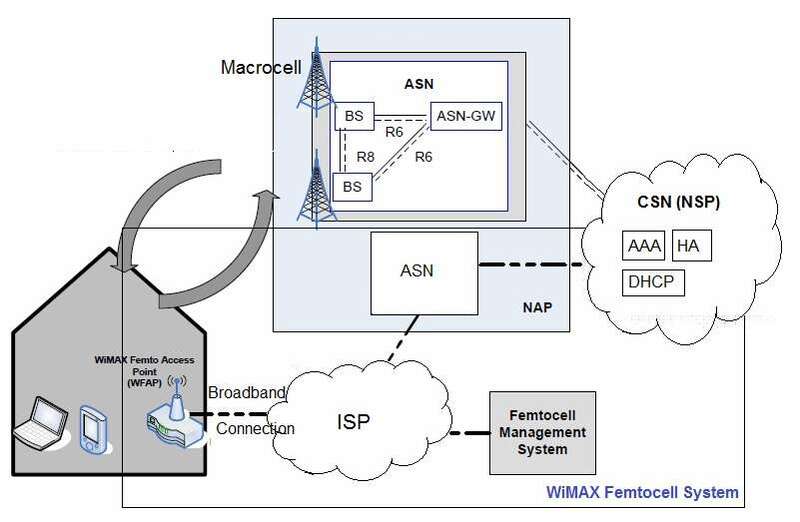 The figure-3 depicts wimax femtocell architecture in wimax network as per wimax specifications published by wimax forum. As shown wimax femtocell access point(WFAP) is interfaced directly with ISP(Internet Service Provider). This ISP provides broadband connection using DSL, Cable, Fiber or Wireless. Handover is needed between femtocell and macrocell in poor signal conditions. It is also needed between femtocell to femtocell when user(wimax CPE) goes out of reach of wimax femtocell coverage. In the same way handoff is required in UMTS and LTE networks. Refer wimax network architecture.